Mom's Gone Bronson! : United Artists Salon and Spa, West Reading, PA.: My New Do, Review! United Artists Salon and Spa, West Reading, PA.: My New Do, Review! This morning I woke up with this fabulous, flowing head of hair that has been slowly growing out for over a year and a half [or so] since I last posted about getting a haircut [18 inches] and donating it to locks of love! I know, I know! I should get a haircut a little more often than every one and a half years, but this last cycle of putting it off was prolonged by an uncomfortable pregnancy and the lack of will to hobble down and get the job done! Well, I am happy to say that [following a long, hot and sticky summer, a new baby and no time what-so-ever to style my ridiculous yeti-like hair] it looks as though my wishes for a decent salon have finally been fulfilled by United Artists Salon and Spa on Penn Avenue in West Reading, PA., which is a just hop, skip and a jump away from where I am currently based! The wonderful folk at the salon [and spa] gave me the opportunity to go over and experience a taste of what they have to offer, by way of a hair cut at the hands of the lovely Kristin, who was already waiting for my imminent arrival as soon as I walked through the door! Greeted with a smile [and a new client form] at the reception desk, it took just seconds to sign in and even less time to feel completely assured that I had come to the right place! I filled out the form and was handed a gift bag for it being my first visit, which I thought was a lovely touch to say the least! What a better way to introduce themselves than with coupons, samples, useful information AND goodies, which included a pen, emery board, clip, fridge magnet [so I wouldn't misplace their number] and a reward card for future visits and savings! Fabulous! Kristin greeted me with a smile and took my coat, sat me down to talk about the direction of my haircut and where I would like it to go. She put together the bulk of my hair and cut off about 12 inches [to be donated to locks of love] before anything else and then ushered me over to wash out my hair! The lady who washed out my hair was very polite and chatty and didn't let me down. She made sure everything was perfect and didn't pull me around or try to drown me [unlike other places I have experienced in the past] and she really kept things upbeat and at ease. Catching back up with Kristin [and with a cup of Joe], I was ready to let her do her thing and get down to business! My cut went ahead without a single hitch and the more that was snipped, the better I felt as the weight was literally lifted from my shoulders! 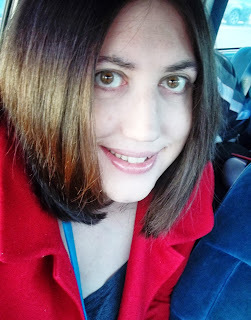 My super-cute new "do" was all ready to go and straightened out for maximum effect! The length was just what I needed and exactly what I had asked for and was the first hair cut I have had in a long time that really made me smile! I absolutely adore the new cut and I am so glad I went in! There are so many times when I have had an excuse not to go through with a cut and so, with the end result being this delightful, i am just sorry I hadn't gone before!! United Artists Salon and Spa is by far the best place I have been for a haircut in years and I can't wait to visit again in the future to try out some of their other offerings such as a manicure, pedicure or perhaps even a massage - I certainly need to get on top of my crazy Einstein eyebrows and so now I have the perfect place to go! The variety of services offered here are so vast that there is certainly something for everyone and, if you are in the area and want to know more, you can visit United Artists Salon and Spa at their website, which can be found HERE! You can also befriend them on Facebook HERE and Twitter, HERE to keep up to date with their latest comings and goings and to book an appointment of your very own! Don't forget: Hair cuts and Spa treatments also make a fantastic gift for the holidays and so United Artists Salon and Spa shimmies and shakes into our Holiday Gift Guide for 2013! I want to say a big thank you to United Artists Salon and Spa for having me visit today, and to Kristin especially for doing a super job!! I will certainly be back for more! Disclaimer: I was given a free haircut in exchange for an honest review - all opinions are my own, Your views may differ. Thank you! Cute new cut! Did they do color, too? Or is just the sun? I got this same exact angled cut a few years ago. Everyone loved it, but i cannot do it again. I feel like I will regret it with a larger face right now lol Looks cute though. Brie - I have a really round face and I always think every cut won't work but I am always surprised. I think you would suit a lot of cuts, you have a pretty face! You look abosultely amazing! Love the cut on you! it looks so good on you girl!!! !she did a great job!!! The shorter hair suits you! I think they did a fantastic job, and you know what, I agree this is the best kind of Gift you can give a busy mom. We never do things for ourselves, and put off pampering. This is much better than something that'll collect dust on a shelf. I have really long hair!! I would be so scared to cut it off! !